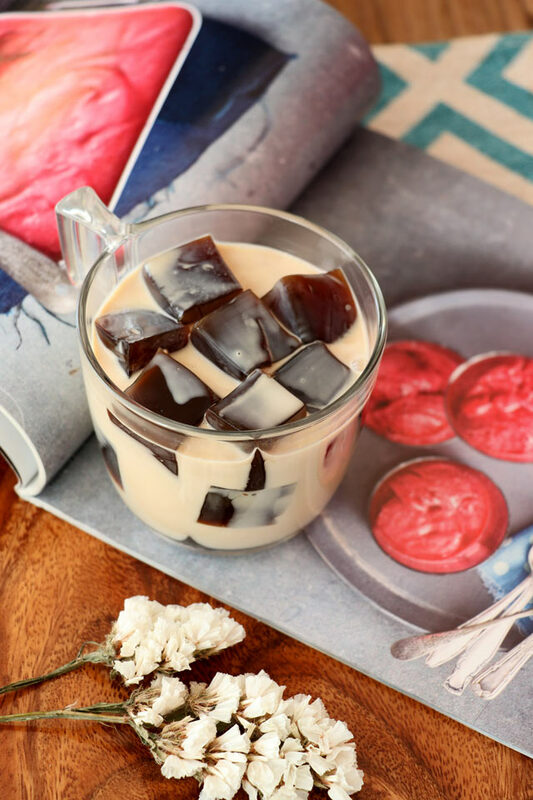 Cubes of jelly, flavored with coffee served in a thick, sweetened cream, this coffee jelly is definitely a crowd-pleaser and an excellent dessert for any occasion. I sometimes wonder how something that is is easy and simple can turn out soooo good. 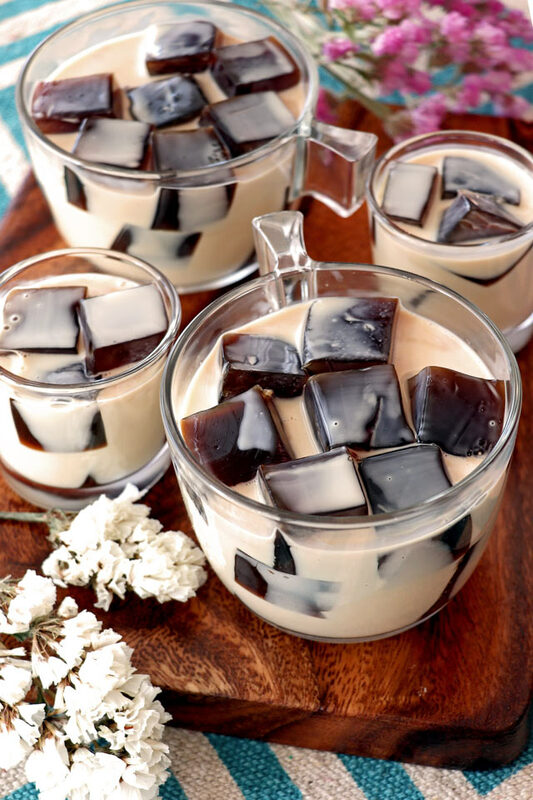 Take this coffee jelly dessert for an example. 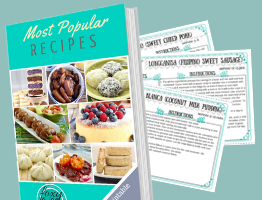 It really is just some jelly, made from gelatin, sugar, and coffee, and cream and condensed milk are added to it and then chilled. So easy and simple yet people seem to love it. The truth is, I have never tried coffee jelly until I made it for my nephew’s Christening. I mean I’ve seen it being served in restaurants and other places but I’ve never touched the thing. Armin and my sisters, on the other hand, had had their shares of testing and tasting. Some would get a thumbs-up but some, at rare times, got spurned. The negative comments would be ‘it’s too sweet or not sweet enough or coffee is too weak or too strong and bitter’. Which I usually just ignore as I was not able to relate at all since I am not a coffee person. Actually, I (used to) detest anything with coffee. I do not like the aftertaste that coffee leaves in your mouth, that is why I prefer tea instead. 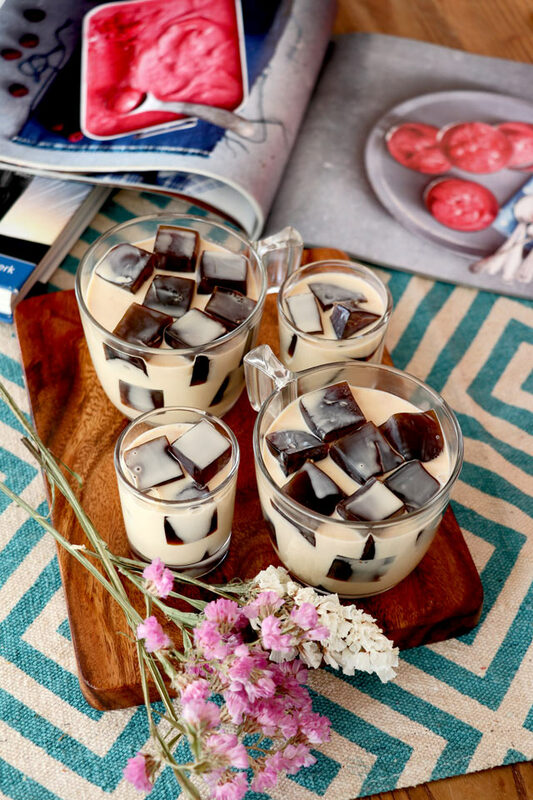 But since I decided to make coffee jelly as part of my dessert table for the reception (because it is easy to make and they look so cute in shot glasses), I had to give it a try. With some advice and after several tasting from my sisters and Armin, I finally got it. And for someone who hates coffee, I had some(several cups) of it during and after making this recipe..and I love it! I was told that the coffee should be a little stronger so it will not lose its flavor and be overpowered by the sweetened cream when mixed. I tried making coffee jelly using both freshly brewed coffee and instant coffee powder. When I was doing the batch for the christening, I realized that we did not have any coffee powder at home since Armin usually prefers freshly brewed coffee (that or the exact opposite, a 3-in-1 where you just add hot water to it). So I just used brewed coffee by making a batch (2 cups) that is twice as strong. But for this one here, I used the instant coffee powder that says strong in its label. Both have its pros and cons. Using the coffee powder, however, will save you a lot of time and if it is of good quality then you can almost not tell the difference. Jelly Powder, also known to us as Gulaman or Agar Agar, is plant-based, usually derived from seaweeds. 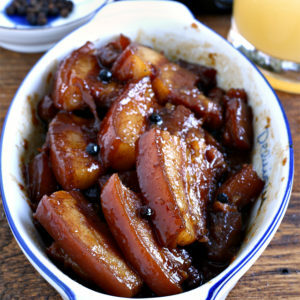 It needs to be boiled for it to set but it can set even at room temperature and much faster than gelatin. 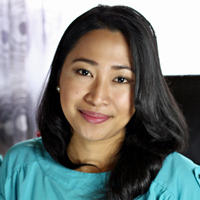 Gelatin Powder is made from animal collagen from skin and bones. Needs only to be dissolved in a warm or hot liquid to set. 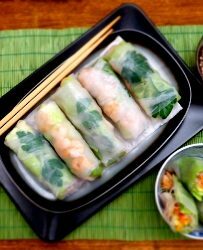 Usually needs to be refrigerated for it to set that can take some hours depending on other ingredients. I used a local brand of jelly powder and 1 pouch (25g) is good for 6 cups of water but I only use 5 cups because I like it a little firmer. 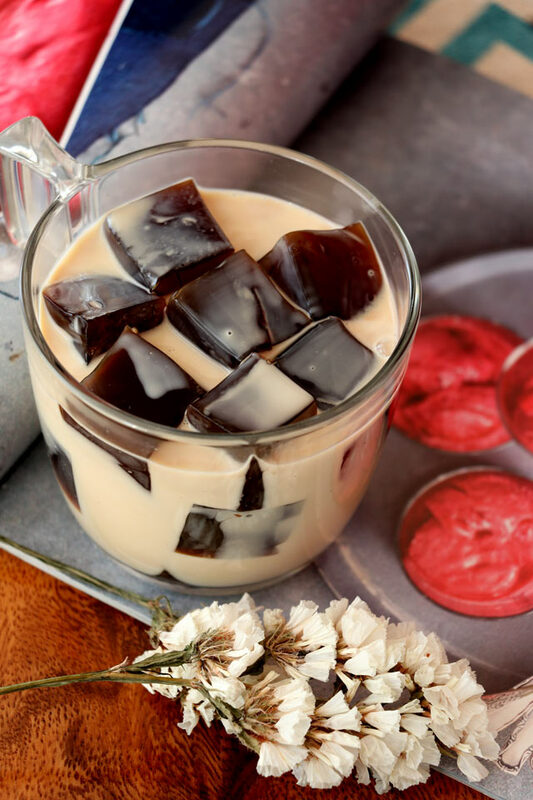 Cubes of jelly flavored with coffee served in a thick, sweetened cream, this coffee jelly is definitely a crowd-pleaser and an excellent dessert for any occasion. In a pot, add water and gradually sprinkle jelly powder, stir until dissolved. Bring to a soft boil then remove from heat. Add sugar and coffee powder and stir until completely dissolved. 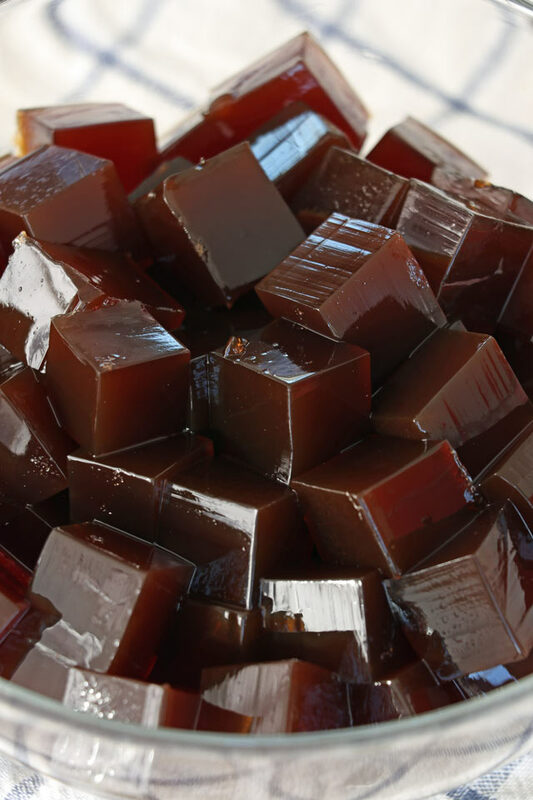 Using a knife, cut through the coffee jelly horizontally and then vertically to make cubes. It could be big or small cubes. In a large bowl or container with lid, mix together the sweetened condensed milk and all-purpose cream until well combined. 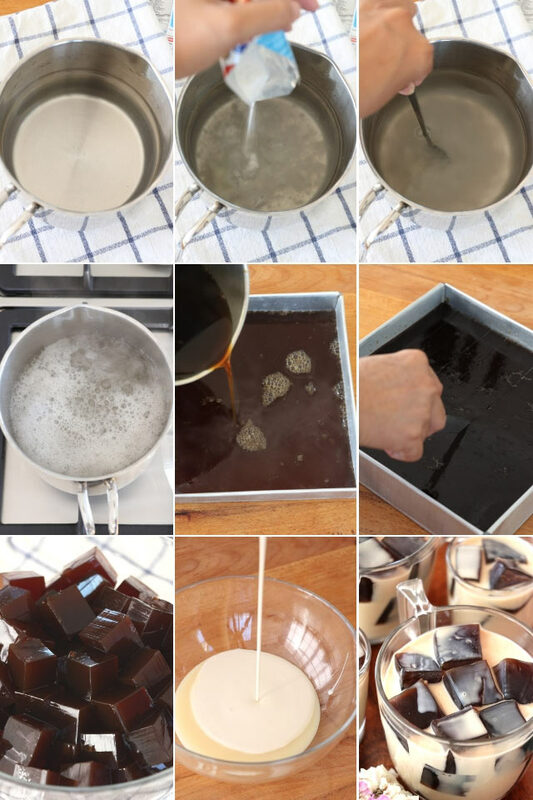 Add the coffee jelly cubes and mix again. Cover and chill. It is best served cold. Note 2. I only used a small can of sweetened condensed milk (168ml) while I added 2 packs of cream (=500ml). This is a personal preference as we prefer desserts not to be overly too sweet. You can adjust this if you like it sweeter. Note 3. I added sugar to the coffee jelly, again a personal choice. You can adjust or skip it altogether if you like.